These cookies were created by our chef, who received his degrees in Culinary Baking & Pastry Arts from the Culinary Institute of America, widely regarded as the finest culinary school in the world. 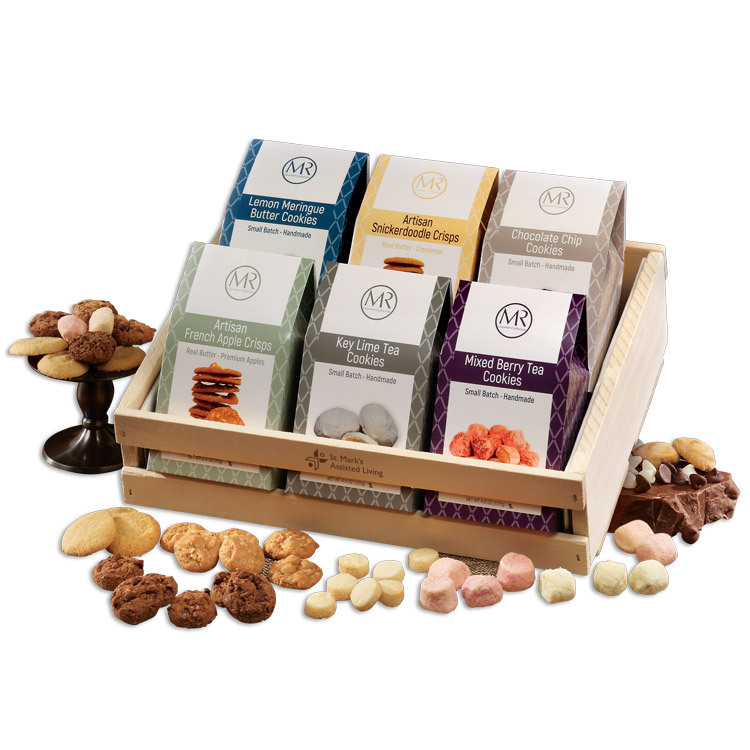 This large crate (Made in USA) is firebranded with your logo and packed with gourmet bite-sized cookies in 6 delicious flavors. After the delicious cookies have been enjoyed, the basswood crate can be used to store magazines, catalogs, or papers. Cookies will stay fresh for 90 days if stored at room temperature. Wooden Crate: 13" × 9.5" × 3.25"
• Imprint Area: 3" × 0.625"
Lemon Meringue Cookies, 4.5 oz. Chocolate Chip Cookies, 4.5 oz. French Apple Crisps, 2.5 oz. Key Lime Tea Cookies, 4.5 oz.